It was built in 1914 by Seirn B.
of Historic Places in 1984. The business of Battle Creek, also known as the Cereal City, is conducted within the walls of the historic city hall building. City Hall may be found at 10 North Division Street, Battle Creek, Michigan. It is over 100 years old, having opened on 31 October 1914. Columns of marble and cherry wood trim can be found throughout City Hall. Historic pictures of Battle Creek and early politicians are hung on the walls throughout the three floors. The landing between the second and third floors has two stained glass windows. One of the windows has the first seal of the City of Battle Creek. It is far from politically correct today as it shows a surveyor clubbing a Native American. To read more about the city seal, click here. One of two stained glass windows on the landing between the second and third floors. Second of two stained glass windows in Battle Creek City Hall. One of the best things about blogging is the contacts I make in response to a blog post that I have written. One such contact was a history teacher in New Hampshire who was interested in Moses Poor's family. She found a cellar hole behind her school and was interested in it and decided to do a little research into whose cellar hole it was. She discovered it was Moses Poor's, who married Hannah Sinkler, cellar hole. I wrote about her comment to my blog here. The teacher sent a very nice timeline filled with property records which I will share with my readers, below. All of the following research was conducted by a wonderful Salem, New Hampshire history teacher. February 26, 1766: Willett Peterson sells 70 acres in Plaistow to Moses Poor (listed as a cordwainer, or a shoemaker) and Joseph Chandler (listed as a tanner). The deed mentions a dwelling house, a barn, and a saw mill. ***November 16, 1770: Moses Poor sells 10 acres of land in Atkinson to Ithamar Emerson. ***March 28, 1771: Moses Poor sells 18 acres of land in Atkinson to Daniel Page. April, 1771: James Clough sells two parcels of land in Salem to Moses Poor; one parcel containing 2 ½ acres and the other containing 46 acres. Moses is listed as living in Atkinson. July, 1771: James Clough sells 5 ½ acres to Moses Poor. Moses is now listed as living in Salem. July, 1772: Moses Poor sells 30 acres of land in Hampstead to James Shepaird. June 17, 1775: Moses Poor dies at the Battle of Bunker Hill. January 15, 1777: A public auction is held at the dwelling house on the Widow Hannah Poor’s property. “Spinster” Hannah Poor (the sister of Moses) with the help of (attorney?) Jonathan Tenney auctions off ⅔ of Widow Poor’s land to Samuel White. The other ⅓ of the land is retained by Widow Poor as part of her right of dower. 1796: Widow Hannah Poor and her son George sell the Widow’s remaining “third” (or right of dower) to Timothy Clough. The deed states that both Hannah and George were living in Candia at the time. Note: ***These three sales occurring between 1770-1771 show that Moses Poor sold exactly half of the 70 acres that he bought jointly in Plaistow with Joseph Chandler in 1766. When the property was purchased, it was recorded as being in Plaistow, but the western section of Plaistow removed itself from the township in 1767 and became the town of Atkinson. When Moses Poor sold the land in 1770-1771,it was recorded as being in Atkinson. My niece, Cutie Pie, turns five today! Happy Birthday, Cutie Pie! Cutie Pie and her family live in another state than I do. I don't see her as often as I would like to, but this past December my husband and I drove my parents to see Cutie Pie's family for Christmas. It has been awhile since I have celebrated Christmas with young children and I loved it. I tried to make the most of my time with Cutie Pie and her brother, Lord Stanley while I was there. Cutie Pie is in full on "Frozen" mode! She isn't a fan of Olaf, though. Needless to say Santa knew about this and her gifts had a lot of Frozen items included. She delighted us, in full Elsa costume, with a song and dance of "Let it Go". This brought back so many memories of when my daughter, Kirsten, would dance and sing that I gave "Elsa" a standing ovation. Cutie Pie did a great job of singing and dancing. Cutie Pie loves to dress up and I got to see her as Elsa from Frozen and Tinkerbell from Peter Pan. Cutie Pie and I had a lot of fun during Christmas vacation. We created crafts, including a Santa Claus made from her hand print. She painted two snowflake pictures on canvas to give to her mom for Christmas. Cutie Pie and I even decorated a gingerbread house. We spent some time watching animated movies on my Netflix account. Now, I am still getting recommendations of movies to watch and it brings a smile to my face when I see The Pirate Fairy recommendations! Once Christmas and Santa arrived we had more toys to play with. I had bought Cutie Pie a game called "Jolly Octopus". It is a mechanical one where the octopus tentacles go up and down while the player is using tweezers to collect little crabs. Cutie Pie was a whiz at that. Another game I bought her was "Take the Cake". Cutie Pie wasn't too sure of it as the box had a creepy face on it, but when we played this shape sorting, cupcake decorating game, she liked it. Cutie Pie and I taking a break from playing. Cutie Pie is an adorable four year old, now five, with boundless energy, a sweet disposition and great smile. She is an awesome big sister. I thoroughly enjoyed every minute I spent with her and I hope she has an awesome birthday. The last day we were there I tried to take a picture of Cutie Pie and Lord Stanley with their grandparents. As the picture above shows, that wasn't an easy task, but boy what memories were made. Cutie Pie will be leaving Preschool and entering Kindergarten in the fall, look out world here comes an awesome little girl ready to take on school and all it has to offer. Have an absolutely, beautiful, awesome, tremendous birthday and have a piece of cake for me. I will be thinking of you. I love you, Cutie Pie. I first heard about the Kimball manuscript, which "Among the Enemy" presents, when I read Mark Hoffman's book, My Brave Mechanics. I put a 'To Do' list item in my genealogy software program to find the manuscript and read it. Mark Hoffman used the manuscript as a source for information about my Civil War veteran ancestor, Samuel Stillman Glover, Jr. I never went to the Burton Historical Collection of the Detroit Public Library, where the manuscript/papers are kept, but I was at the Michigan Historical Center in Lansing, Michigan and browsing through their museum gift store when I saw the book, "Among the Enemy" edited by Mark Hoffman. Of course, I bought it after seeing it contained Kimball's journal entries. William Horton Kimball was a member of the First Michigan Engineers and Mechanics during the Civil War. His personal writings are what make up what I call the Kimball manuscript. The manuscript is two books that includes a memorandum volume and a ledger. Kimball shared, through writing, his experience during three years of union civil war service. Kimball included detailed accounts of combat and guerrilla warfare, interactions with civilians, personal opinions of military leaders and more. Mark Hoffman has taken Kimball's manuscript and added to it. 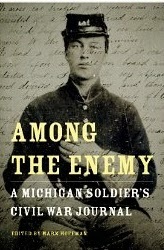 Among the Enemy: A Michigan Soldier's Civil War Journal edited by Mark Hoffman provides the reader with unique insight into the life of a civil war soldier, especially one who is in the background of the conflict. Hoffman states, "I have intentionally tried to let Kimball tell his own story, providing only introductory and contextual material in each chapter and limiting footnotes." (p3) Hoffman has spent many years researching the civil war and has read many Civil War diaries and journals. He "considers Kimball's to be among the most interesting and valuable..."(p1). Hoffman starts his book with a short introduction, followed by Chapter 1, "Off to War". This chapter's introduction provides a biographical sketch of William Horton Kimball. Kimball's journal starts in September of 1861 when he decides to enlist and continues until 17 November 1864, when Kimball arrives home to Jackson, Michigan. Other chapters detail the work that the First Michigan Engineers and Mechanics did in such places as Kentucky and Tennessee, building and repairing bridges and railroads in order to keep supply lines open as well as support troop movements. Each succeeding chapter is filled with Kimball's words describing his experiences through short journal entries, all of which are dated. Additionally, Among the Enemy, includes maps and pictures which adds to this wonderful work about the civil war. Hoffman's book was well written and I appreciated being allowed to experience the Civil War through Kimball's eyes. My research of Samuel Stillman Glover, Jr. through his compiled military service record and pension record confirms what Kimball wrote. Samuel volunteered to carry dispatches to General Buell's headquarters in Huntsville, Alabama. He was attacked by guerrillas and shot in his right knee. He clung to his horse until he met the 35 Indiana, from there the dispatches were sent to Huntsville. I highly recommend Mark Hoffman's Among the Enemy book to anyone who has an interest in Civil War history. Hoffman's introductions adds context to Kimball's journal entries and allows the reader to see the Civil War through the eyes of someone who was there, William Horton Kimball. It is an experience you won't want to miss. 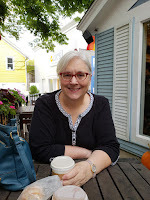 I have been a delegate to the Michigan Genealogical Council (MGC) for the last year or so. Delegates serve as liaisons between the council and their local genealogical societies. I have enjoyed being a delegate and when asked if I would consider serving in some capacity on the MGC board, I said yes!. I had been wanting to become more involved on the state level and guess what? I did. Last week elections for the Michigan Genealogical Council were held at the delegate meeting and I was elected as corresponding secretary. My official start date is in July. The board is comprised of five incumbents and four newly elected members. I will be joining a great group of people and I am looking forward to working them. Newly elected members are Vice President Kathryn Willson; Treasurer Jill O’Sullivan and Trustee Faye Ebach. We will join current board members President Thomas Koselka; Recording Secretary/Delegate Sue Irvine; Recording Secretary/Board Marilyn Sayler; Trustee James Thornton and Trustee Jan Tripp for the next year. The Michigan Genealogical Society was organized in 1972. 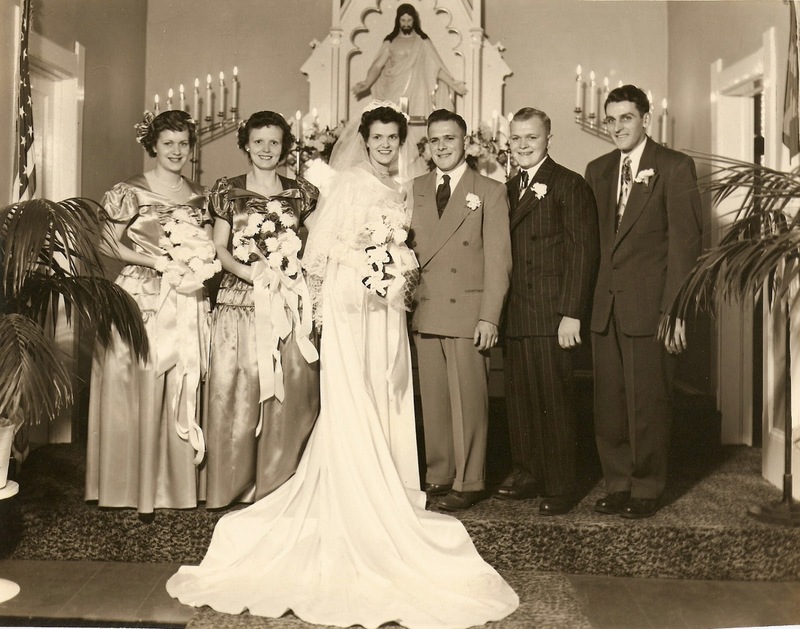 MGC membership is open to any genealogical or family history society, amateur or professional, with a primary interest in genealogy. MCG serves the citizens of Michigan through coordinating genealogical activities of statewide interest; cooperating in the location, preservation, publication and deposit in suitable repositories, of Michigan records of value to genealogists; providing information to the genealogical societies membership regarding speakers, teachers, seminars and workshops and encouraging and/or working with other organizations or agencies involved in promoting improvements in genealogical facilities and holdings of Michigan archives, libraries, museums and record repositories. I will continue serving Calhoun County Genealogical Society as President in addition to serving the state. MGC has provided great service to the Michigan genealogical community and I look forward to helping continue that tradition. It is so much easier to do research when it is in the town you live in. Such was the case when I went to my local library, Helen Warner Branch of Willard Library in Battle Creek, Michigan to do newspaper research. The Battle Creek Enquirer is digitized and available at the library. I can access issues from 1846-1923 from my computer at home with my library card, but for 1924 to the present a visit to the library is needed. The Battle Creek Enquirer published articles during World War II under "News of Our Men in the Services" section. It was here that I found numerous articles about my dad's first cousins Jack and James Tyson, the sons of Victor and Adeline(Glover) Tyson. John 'Jack' Glover Tyson (8 July 1923-17 Sep 2010) lived in Battle Creek when he went to serve in the Army during World War II. He was a paratrooper with the 11th Airborne Division, the Angels. The 11th Airborne Division consisted of one parachute and two glider infantry regiments as well as supporting troops for the three regiments. 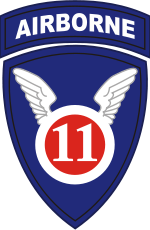 The 11th Airborne Division was transferred to the Pacific Theater in June of 1944. 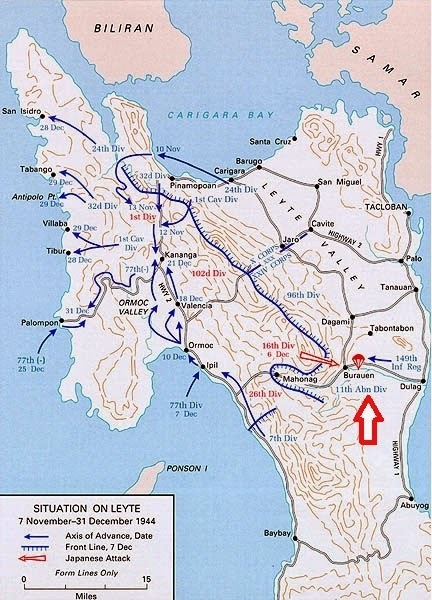 Its first action was on the island of Leyte in the Philippines, which the below article is about. This division saw action with the invasion of Luzon and Manila, and conducted a raid on Los Banos internment camp in the Philippines. I have left the article as it was written at the time in 1945, it is not politically correct by today's standards. 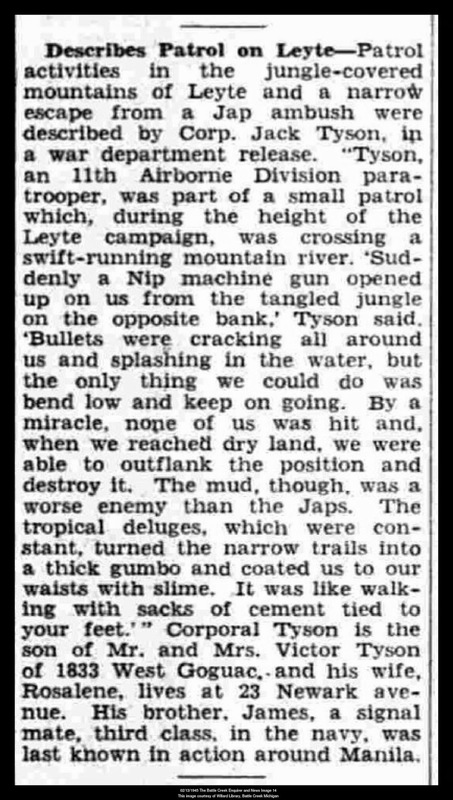 Describes Patrol on Leyte-Patrol activities in the jungle covered mountains of Leyte and a narrow escape from a Jap ambush were described by Corp. Jack Tyson, in a war department release. 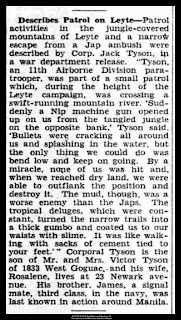 "Tyson, an 11th Airborne Division paratrooper, was part of a small patrol which, during the height of the Leyte campaign, was crossing a swift running mountain river. Suddenly a nip machine gun opened up on us from the tangled jungle on the opposite bank, Tyson said. Bullets were cracking all around us and splashing in the water, but the only thing we could do was bend low and keep on going. By a miracle, none of us was hit and when we reach dry land, we were able to outflank the position and destroy it. The mud though, was a worse enemy than the Japs. The tropical deluges, which were constant, turn the narrow trails into a thick gumbo and coated us to our waist with slime. It was like walking with sacks of cement tied to your feet." Corporal Tyson is the son of Mr. and Mrs. Victor Tyson of 1833 West Goguac, and his wife Rosalene lives at 23 Newark avenue. His brother James a signal mate, third class, in the Navy, was last known in action around Manila. Source: News of Our Men in the Services: Describes Patrol on Leyte, Battle Creek Enquirer, Battle Creek, Calhoun, Michigan, United States, 13 February 1945, p14; column 2. Philip Valentine Graf is my second great granduncle. He is the brother of my second great grandfather, Johann Caspar Graf. Philip Graf was born 2 January 1838 and baptized 8 January 1838 in Rockenhausen, Pfalz, Bavaria. He was one of seven children born to Johann Philip Graf and Sophia Kolter. He arrived in New York City having traveled aboard the ship "Southhampton", in 1851. Philip married Elizabeth in 1861, possibly in New Jersey. They were the parents of four children: Charles, Katharine, Henry 'George', and August. 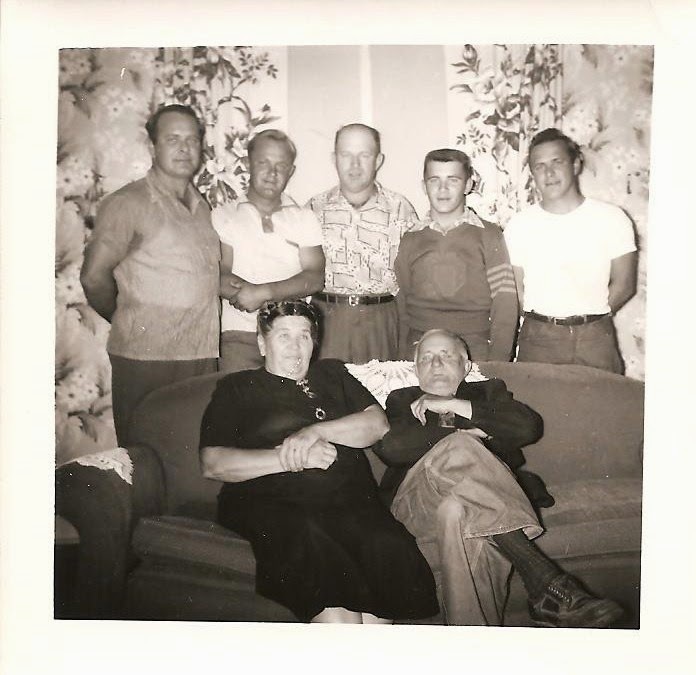 The Philip V. Graf family settled in Peru, Miami, Indiana. Philip was a saloon keeper in Peru. He died on 23 August 1919 and is buried in Mount Hope Cemetery, Peru, Miami, Indiana. This question has been asked by me many times as I research Daniel Fenn. My records of him start in 1808, at the age of 21, when he married Huldah Rowley. I have no record of Daniel's first 21 years of life. Where in the World are you, Daniel? 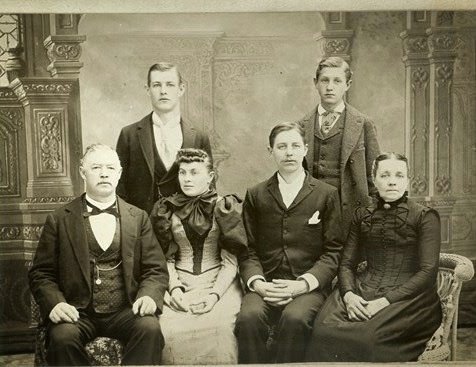 Daniel Fenn is my paternal, third great grandfather, of parents yet to be identified. I don't have a place of birth for him. I have done some research with census records, that I don't have, and this is what I found. 1790-Daniel would have been about 3 years old. There are 33 Fenn's in this census. 1800-Daniel would have been about 13 years old. 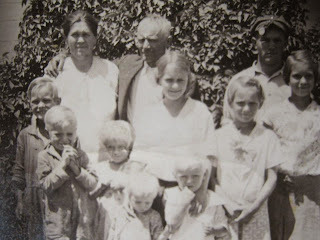 There are 14 Fenn's in this Census with a boy between the ages of 10-15. 12 are living in Connecticut and 2 in New York. Narrowing it down further is hard because I don't know if Daniel had any siblings. 1810-Daniel would have been about 23, married to Huldah Rowley, age 21. Daniel and Huldah were married in Shoreham, Addison, Vermont in 1808. I could not find Daniel in Shoreham census records during this time. I found Huldah's father, Hopkins Rowley, with a male and female living with him that were Daniel and Huldah's age. Could Daniel and Huldah be living with her father in 1810? More research and information needs to be conducted to determine Daniel's residence during his early years and to identify his parents! Richard McGee's family were pioneers in Canada West (Ontario) Canada, which I thought would make him an easier person to research than others. Alas, this is not true. I have been writing ancestor biographies since I started blogging and have been writing them in the order they appear on my pedigree chart. I did not write one ancestor biography in 2014 because Richard McGee was the next ancestor to be highlighted. I didn't think I had enough information to write one on him, but have decided to write up what I know and see where the blanks in my research are. Trying to nail down a birth year for Richard McGee has been a challenge. Just about every record I have found for him has a different year of birth. 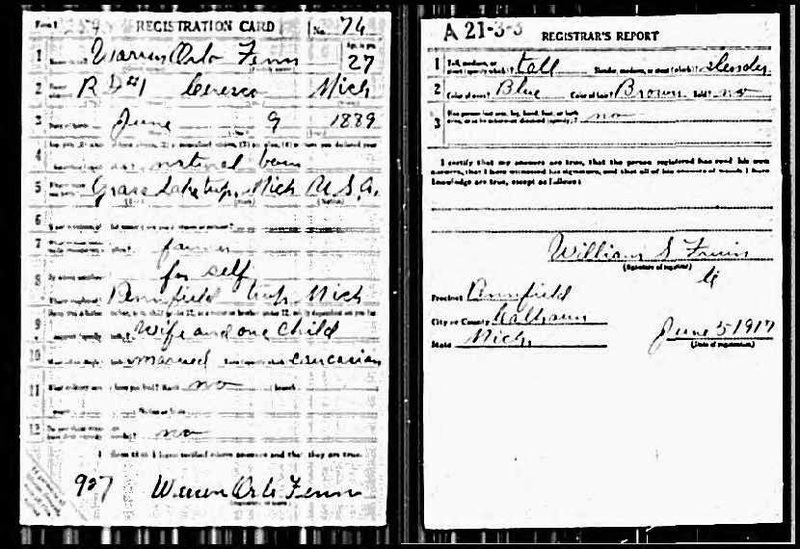 Since I have not found an exact birthplace I have been unable to find a birth record. For the time being, based on death records only, I am placing his birth year about 1835, in Ireland. The 1901 Census of Canada gives a date of birth as 24 May 1850, but since I am pretty sure he didn't father a child at age of 12, this is incorrect. 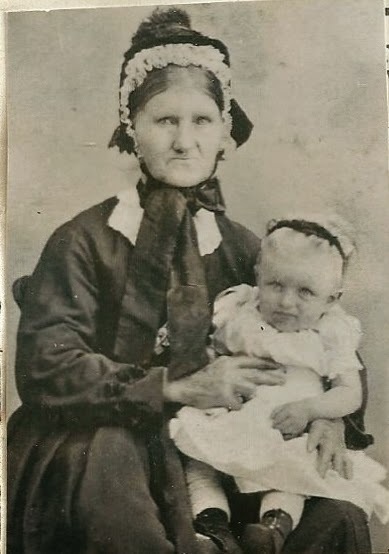 Richard's daughter, Catherine McGee Watt, my paternal great grandmother, was born 2 September 1862. My thoughts on the changes of birth year have to do with marrying his second wife, Mary, who was 24 years his junior. Source: 1871, Collingwood, Grey North, Ontario, Canada, district 37 Grey North, subdistrict Township of Collingwood, division 1, p77-78, Line 20 p77, Richard McGee ; digital images, Ancestry.com, Ancestry (www.ancestry.com : accessed 7 December 2010); Roll C-9953. The first Canadian record I have found for Richard McGee is the 1871 Census of Canada, age 28 and birth year 1843. He is living in Collingwood, Grey North, Ontario, Canada with his wife, Sally J, age 26; Catherine, age 8; and Isabella, age 2. Richard married Sarah Jackson about 1861-1862. I base this date on the fact that Sarah is found living with her parents in the 1861 Census of Canada and their first born child, Catherine, was born in 1862. 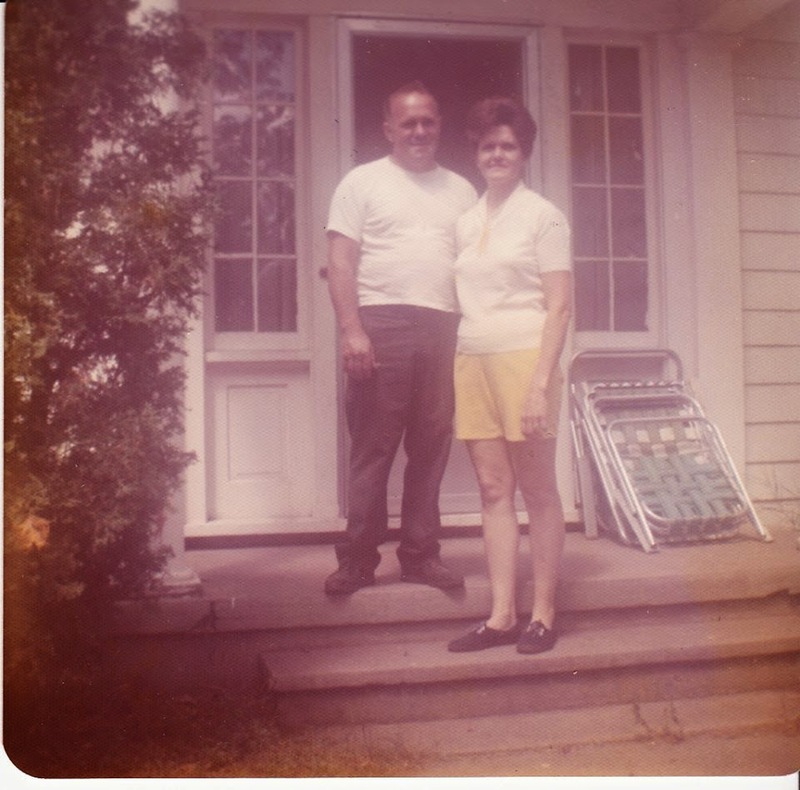 A marriage record for Richard and Sarah has not been found and further research in Ontario, Canada will be needed to confirm their marriage. 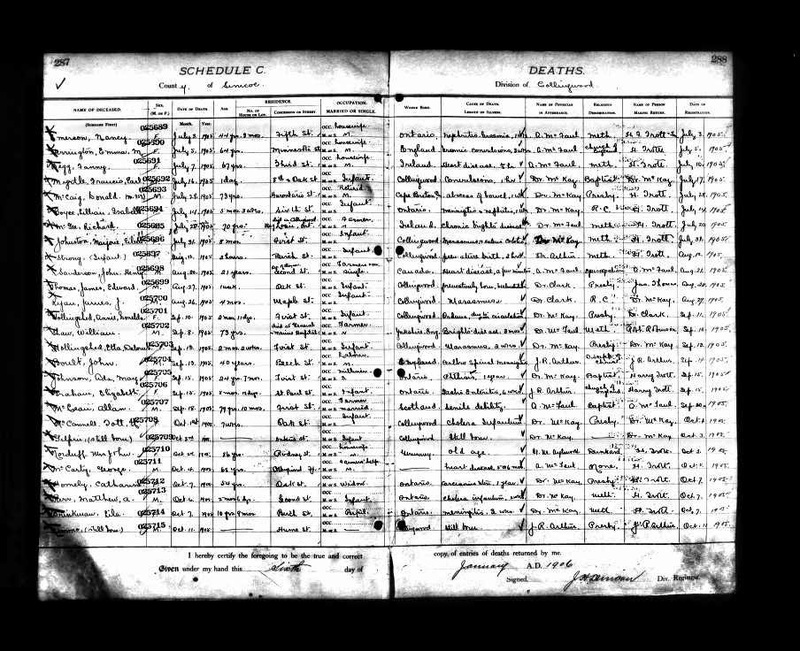 Richard's information on successive census is uniform in the areas of Birthplace-Ireland and Occupation-Farmer. Otherwise, nothing is the same from census year to census year. Year of birth is recorded as 1824, 1841, 1843, and 1850. Religion is recorded as Church of England, Methodist, and English. Obviously, I have a lot of work to do with Richard McGee's research. Catherine McGee (2 September 1862-22 January 1932). Catherine was born in Collingwood, Grey, Ontario, Canada. She married David Watt on 16 May 1883 in St. Ignace, Mackinac, Michigan. She died in Marquette, Marquette, Michigan, United States. Isabella McGee (1 October 1868-14 September 1952). Isabella McGee married Richard Simmons on 8 November 1896. 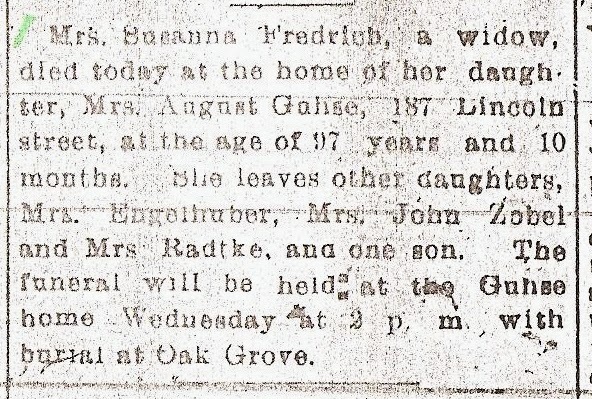 She died in St. Louis County, Minnesota, United States. William John McGee (10 July 1871-). William was born in Collingwood, Grey, Ontario, Canada. He married Laura Kirby on 30 January 1900 in Thornbury, Grey, Ontario, Canada. I haven't found a date or place of death, yet. James McGee (25 February 1877-) This is the only information that I have for James McGee. Richard marries Mary May, prior to March of 1881, when their first daughter is born. Richard and Mary can be found in the 1881 Census of Canada. Richard, age 40; Mary, age 22; Catherine, age 18; Isabella, age 13; William J, age 9 (all Richard and Sarah's children) and Margaret, age 1 month. There is no James McGee living with Richard and Mary. I wonder if James' birth was a difficult one and resulted in his death, and Sarah's shortly after. 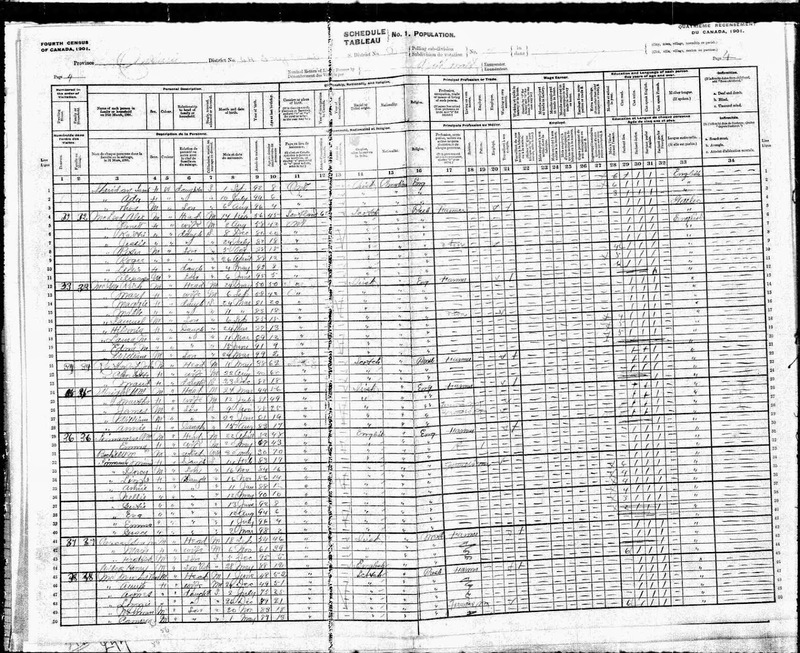 All seven children are living with Richard, age 50, and Mary, age 42, in the 1901 Census of Canada. Source: 1901, Ontario, district District Number 64 Grey East, subdistrict Collingwood, division A-7, p 4, Family Number 33, Richard McGee ; digital images, ancestry.com, ancestry.com (: accessed 5 December 2010); Library and Archives Canada. Census of Canada, 1901. Ottawa, Ontario, Canada: Library and Archives Canada, 2004. . Series RG31-C-1. Statistics Canada Fonds. Microfilm reels: T-6428 to T-6556. Source: "Ontario, Canada Deaths, 1869-1934," digital image, ancestry.com (http://search.ancestry.com/iexec/?htx=List&dbid=8946&offerid=0%3a7858%3a0 : accessed 13 May 2009), Entry for Richard McGee; Archives of Ontario. Registrations of Deaths, 1869-1934. MS 935, 496 reels. Archives of Ontario, Toronto, Ontario, Canada.Archives of Ontario. Registrations of Ontario Overseas Deaths. MS 944, 11 reels. Archives of Ontario, Toronto, Ontario, Canada.Archiv. Richard McGee died 20 July 1905 in Collingwood, Simcoe, Ontario, Canada at the age of 70. He died of Chronic Brights Disease, which is a disease of the kidneys. Richard McGee is buried in Thornsbury-Clarksburg Cemetery in Thornbury, Grey, Ontario, Canada. His gravestone can be found at Find a Grave. He is buried with his wife, Mary, and next to his wife, Sarah. 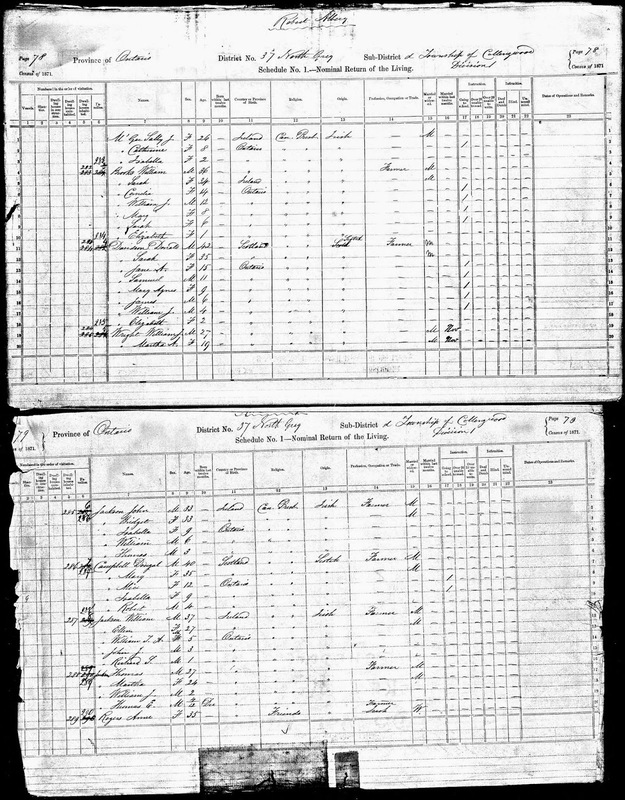 Richard McGee's biography has been filled with information on his family and census records. There is so much more to know about Richard. I believe a trip to the Collingwood area in Ontario is going to be needed to know more about Richard and his life. Further research is needed in the areas of land records, immigration, and church records. Michigan has a lot of historical museums in its state, but none are better than those of the Tri-River Historical Museum Network. The best news is that the first weekend in May, every year, they are open and free. "Spring Into The Past" featuring "America's Pasttimes" will be held Saturday, May 2nd and Sunday, May 3rd, 2015, from 11 AM to 5 PM. Old Fence Rider Historical Center in Edmore – barbed wire and more! Visitors will find old churches, historical homes and barns, one room schoolhouses, railroad depots, restored rural villages, and more during their travels. 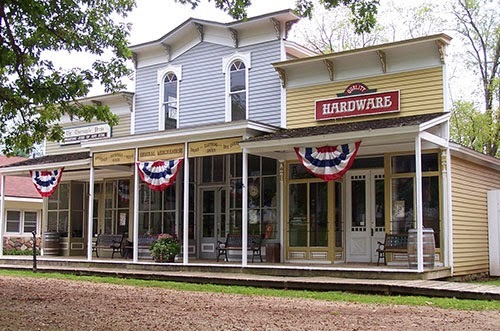 All of these unique museums are maintained and preserved by local historical societies. A full .pdf booklet with information on each site and a map can be found here. This would be a great activity for the whole family. Gas up your car, grab grandma and grandpa or the grandchildren, and discover the rich history that Pure Michigan offers.